When I moved here, I was expecting my life to be, well glamourous, James Bond in a tuxedo sipping on Martinis, and so on. It hasn’t turned out that way so far. My move to Europe has been more like a cross between National Lampoon’s European Vacation and an episode of Coronation Street. So I have decide to inject some glamour into my life. 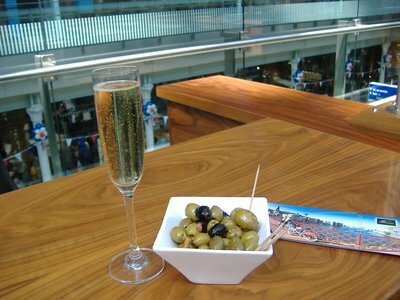 For that reason, On Sunday, July 13, 2008 at noon, I could be found at St. Pancras International train station, sipping on champagne at Europe’s longest champagne bar and getting ready to take the Eurostar to Paris, where I would check into the Renaissance Venodome for a few days of rest away from the pressures of finding jobs and places to live and such. In addition, I would be there to see the Bastille Day Celebrations, the national day of France which takes place every July 14th to celebrate the 1789 storming of the Bastille, a key event in the eventual march to independence and the creation of the Republic of France. 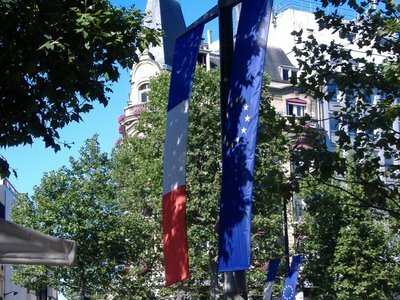 While we know the day in English as Bastille Day, here in France they call it simply the Fête Nationale, the National Holiday. For my friend Chris, I will mention that Bastille Day is also a ripping song by Canadian Rock Group Rush, but that is probably a whole other blog entry. Ah, Paris, that beautiful city on the banks of the Seine. It’s really Paris’ fault that I moved here to Europe at all. 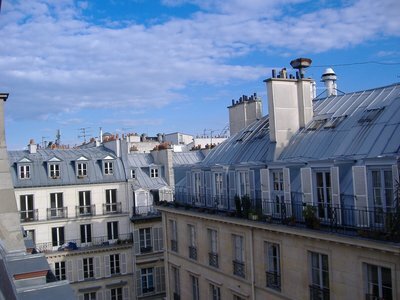 Prior to coming to Paris for work in 2005, I was content to leave Europe to itself. Other than a 6 hour layover in Amsterdam on my way back from Tanzania, I hadn’t set foot on the continent. It probably says a lot about my feelings on visiting Europe that I choose to travel to South America and Africa before heading over there. Frankly, prior to that 2005 trip, I always kind of considered Europe dull. It was the old world. Why bother with the old world when there was so much more interesting stuff to see? The new world, the dark continent, the Asian tiger! Now those were places that sounded exciting. The old world? The home country? Yawn. Not surprisingly, that sent me heading directly south from Toronto towards South America. I bounced around there for a couple months, landing eventually in Buenos Aires, the most “European” of the Latin American destinations. I hated it. It was old, in shambles, full of poor people digging through garbage while rich folks drove in Mercedes Benzes to fancy clubs with $US 9 cocktails. “If this is what Europe is like, they can keep it,” I thought. Honestly, I did want to see Europe, eventually. It seemed like the kind of place to leave off until I was old, when sitting on a bus getting driven around Italy with a tour guide pointing to the left or right so you knew which way to point your camera. It also says a lot about my impression of Europe that on knowing that I would be there for a few weeks, I planned a vacation at the end of it not to explore more of Europe, but to take a train to Asia. Other than a half a day in Brussels and a couple days in Moscow, I was ready to roll right out of Europe and leave it in my rear-view mirror as quickly as I could. My Paris-Hong Kong rail trip was planned and booked before I spent any significant time in Paris. I’d only spent a week there before the tickets were all booked and the visa processing was underway. Then I settled into, spending my days going to work, riding the metro back to my hotel and heading out for a bite to eat. 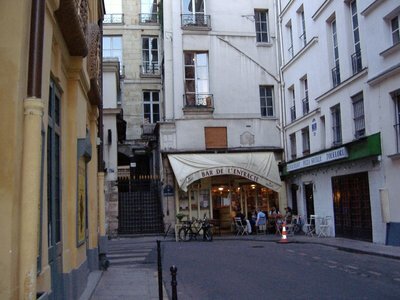 This was the fall of 2005, which was beautiful, and I usually took the opportunity to sit outside on the Parisian patios and enjoy a nice dinner and a glass of beer. It wasn’t the old buildings that was impressive or the cobblestone streets or historic monuments that really grabbed me. It was the lifestyle. It was more relaxed and more urban than what I knew from home. Paris was a lively place, old couples and young families mixed on the streets with young singles out for a good time. We worked hard when we were in the office, but out on the streets at night, people just let time flow by. Dinner would take hours, but it didn’t matter, because people were together. That started it. I don’t know if I even realized it at the time, but once I was back in North America, my mind would often wander to my time in Paris. It had infected me, and I wanted to experience more of that life. So we can blame it on Paris. She intrigues, she pulls you in, makes you feel comfortable, makes you think this could be home. She is a beautiful woman. Why else would a man quit his job, leave his life and family behind to travel over the ocean and start a new life than to chase after a beautiful woman? Check in for the train went quickly, and I passed through French customs without even a word from the border guard, just a stamp welcoming me to France, even though I was still in the basement of St. Pancras station. 20 minutes prior to departure, the train was ready for boarding. After a quick check of my boarding pass from a gate agent, I was up on the platform. After a quick glance up to admire the beautiful glass roof, I headed off to my carriage. I boarded the train and grabbed my seat. The train seemed to be mainly filled with French folks, returning from a weekend in London. There were a few grubby backpacker types, which normally I would be, but as I was trying to inject some glamour into this trip, I had dressed up. 10 minutes prior to departure, and I had settled in to my window seat. My suitcase was stored above me, my book and bottles of water were tucked into the seatback in front of me, and my laptop bag was dashed away at my feet. I was ready to roll. 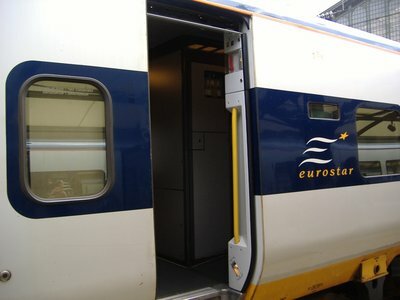 A young girl, probably about 15 was escorted on the train by one of the Eurostar attendants, and took the seat beside me. She stowed her larger bag above the seat, and then sat down. After a few minutes digging through her massive shoulder bag, she looked over at me. “Vous etes Francis?” she asked. My stalling worked, because I finally translated the phrase in my head. She was asking me if I was French! I prepared my answer, “Non, je suis de Canada,” and was about to deliver it, but she beat me to it. “Never mind, you are English,” she said, somewhat derisively. “Can I ask from you a favour?” she said in thickly accented and halting English. “I want to watch my Dee-Vay-Dee Player, and I would like to sit at the window, for it has the... ummm...” she paused, searching for the word. I looked down to my left and saw the power plug. “Power outlet,” I suggested. She smiled and nodded. So we switched seats, and I settled in again, this time to an aisle seat. Before I could complete my phrase, “un peu,” a little, she pre-empted me and completed the phrase for me with, “un petite peu,” a very little. Ouch. She smiled and went back to her DVD. The train took off. I kept my eye out for the partial constructed Statford station that will service the Olympic area in 2012. Not much to see except some platforms, as the train is in a ditch and the station is all above, and then settled into my book, “Playing for Pizza,” by John Grisham. It’s about an American football player that moves over to Italy to play in their professional American football league. A fish out of water story about a guy in a strange land who can’t speak the language. After my encounter with the girl with the Dee-Vay-Dee player, I wondered if I am about to get the same experience in Paris. The ride over on the Eurostar was quick and mostly uneventful, though we did arrive 30 minutes behind schedule due, we were informed by an announcement in French-accented English, to “the train in front of us hitting an animal on the track.” For full effect, drop the “H” in hitting and pronounce the word animal as so, “an-e-mal.” Really quite charming. We arrived at the crowded and dirty Paris Nord station, which looks pretty much as it did when I left from here in October of 2005 for my Paris to Hong Kong rail odyssey. That was the last time I was in the city, and must admit that I had missed it. I bought some Metro T+ single fare tickets, checked the map so I knew where I was going and walked outside the station. I sighed. It was good to be back. My plan was to walk from Paris Nord to the Poissonieres Metro Stop, and then take the 7 train down to Pyramides and my hotel. In attempting to execute that plan, everything about my Paris experience came back to me. I got lost on way from Train station to Metro. Paris, redesigned famously by Baron Haussmann to include wide boulevards appropriate for strolling makes it a nice city to walk in, but Haussmans love of the traffic circle means that no street really runs straight, or for more than a few blocks, and so it’s easy to get lost. I probably walked further trying to find the metro station than the ride from Poissonieres to Pyramides, but eventually found the Metro and was on my way. The hotel is beautiful. 5 stars, just two blocks from the Place de Concorde. I am given a nice room on the top floor, with French doors that open out onto a view of the street below. My original thought that the conference was an EU function was based on more than just speculation, though. The presidency rotates every 6 months, and France has recently taken over the presidency of the EU. It is quite a big deal here. 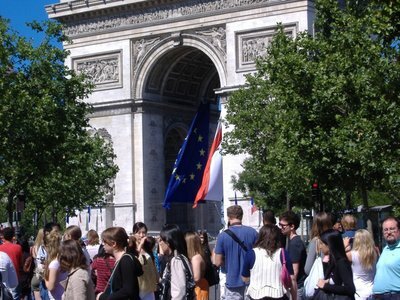 Everywhere I look, whenever I see the Bleu, Blanc and Rouge (the flag of France), I see a blue background with 12 yellow stars beside it (the flag of the EU). To further celebrate the EU presidency, the National Assembly building on the south bank of the Seine is lit up with pictures and text celebrating Europe’s great accomplishments, ending with a note that there are 495 million Europeans. I wonder if I am included in that tally? 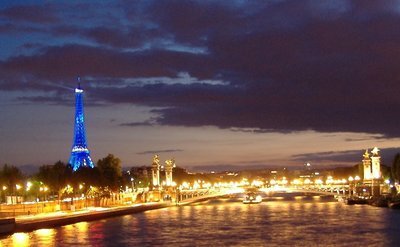 The Eiffel Tower, the symbol of Paris, is also in on the EU fever. 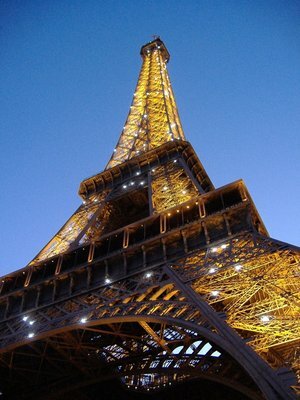 The tower is being lit in blue at nights, with 12 yellow stars adorning her north side. An EU flag rendered in iron and rivets. I grabbed a map of Paris from my hotel, and go out for a wander. Even with the map, without careful attention it is easy to get lost. The map is also quite confusing. In addition to the streets in all directions, there are metro stations every 2 blocks. There is no way that the map could fit all the names on, so the stations are marked on the map with a number and a symbol (circle or square), and there is a legend off in the corner to decode the numbers. It’s a task at times. After wandering, I found a quiet looking restaurant on a corner that seemed appropriate for dinner. The menu was placed outside, written up on a chalk board. I was reading it over, translating the dishes in my head when the waitress approached. “I speak English too,” she said, a detectable American accent. “Are you here for drinks or to eat?” she asked, and thus I was able to put together what her original question in French had been. Turns out the waitress was from California. She had done a semester in France, and after graduating had decided to move back. I asked where in California she was from, having a fair bit of familiarity with the Bay Area myself. “Los Angeles,” she replied. I cringed. No wonder she wanted to move to France. “No, I read it better than I speak it,” I said. “Or hear it,” she added, helpfully. Ouch, again. I ordered a leg of duck in pepper sauce, and on her recommendation a 1/2 litre of white wine. Beautiful. With still a few glasses of wine left in my carafe after finishing dinner, I decided to get some desert, something I don’t normally do (despite what my gut might indicate to the contrary. That’s all beer in there, no desert). I was tempted by the chocolate mousse, but went with a cheese plate instead. I left the restaurant full and happy. Walking along the streets, I came across this amazing little scene by the Palais Royale. It looks like a painting of Paris from the late 1800s, but was happening in 2008. 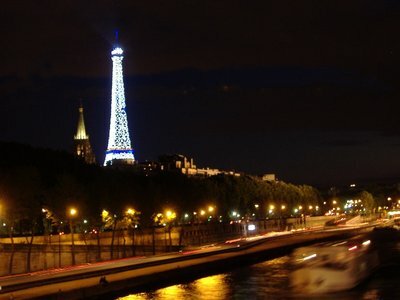 That’s the amazing thing about Paris, is that it looks like a place stopped in time, but acts like a very modern city. All these modern people with their modern fashions and modern cars dropped into a city from the past. It’s truly a remarkable place to exist in, even for a few days. I had to wander around for a few more hours. It gets dark here so late. Coming from Toronto, I like to think of Canada as the True North, Strong and Free. But really, Toronto is pretty far south, in line with the south of France. Places like London and Paris are much further North than my hometown, and so the sun is still in the sky at 10:00 at night here. After snapping some photos of the Eiffel Tower lit up at night from the bridges across the Seine, I find my progress blocked by road closures. The flyer at the hotel had said that streets would start closing at 6 in the morning, but apparently the Police Nationale decided to start shutting them down around 10:30 at night. I finally make it back to the hotel for midnight, and quickly fall into bed. My alarm is set for 7:45 tomorrow morning so I can get up and get a place to see the parade. That title isn’t a joke. I know, many people in North America will think it is. France doesn’t exactly have a reputation as being a military strong man, but it actually is. It is the largest force in Europe (by solider count) and the third largest cache of nuclear weapons, behind only America and Russia. France spends more on their Military than any other country in the world except for America. The Fete Nationale is a chance to show it all off. I left the hotel early and try and head the two blocks to the end of the parade route, only to discover that the police have blockaded most the streets, and I soon found myself working through a rat maze of blocked streets and police instructions until I find myself closer to the Arc de Triomphe than Place de Concorde and my hotel. Understandable, though, as Place de Concorde is where all the big-wigs sit, so they are keeping the unwashed masses as far away from them as possible. Though, one would think with the largest military force in Europe parading down the streets today, the leaders of the free world would be safe? Anyway, no hard feelings on the parade herding, as I went through the same thing to see the Thanksgiving Day parade in New York City in 2006. It is typical of our times, I suppose. When I was a kid, you would show up at a parade and stand right on the curb. If you stepped out onto the street, one of the police man stationed every 50 feet or so would whistle at you to get back on the curb. Nowadays, its armed guards, barricades and standing back from the street. Unfortunately for me, by the time I found a spot, I’d spent an hour following the maze in a slow moving crowd, and all the spots near the front are taken. I found myself watching the parade behind row upon row of heads in front of me. So as the foot soldiers, mounted calvary and mechanized calvary marched and rode and drove by, I didn’t see much of it. I did manage to catch a glimpse of the President of France, Nicolas Sarkozy as he rode by on a troop inspection. He was standing in the back of a jeep, and frankly seemed more interested in waving to the crowds than actually inspecting his troops, but it was nice to get a smile and wave from the French President. His wife Carla Bruni, was not with him. France was nice enough to fly some of its most expensive military might right over my head, though, so I did get to see some of the parade. Planes, helicopters and even skydivers filled the air. I captured some of it on film, and cut it together, resisting the urge to use the song “Danger Zone,” from Top Gun, I have set it to La Marseillaise, the National Anthem of France, recorded by David Zinman and the Baltimore Symphony Orchestra & Chorus. About one minute in is some shots of the tanks. You can just barely see the heads of the soldiers as the tanks roll by. I included it more for the sound. It is deafening hearing them roll down the street, a real warfare of intimidation. I already had a lot of respect for that student in Tiananmen Square in 1989 who stood in front of the tank, but after hearing them today, that respect doubled. Frankly, the sound alone is enough to make you pee your pants and want to go hide. I had an easy afternoon of surfing the web, reading my book, watching some TV and having a bath (Shh, don’t tell anyone I’m a sissy). After having walked the entire length of the Champs Elysee in the morning I wanted to rest up, as I knew I would probably have another long walk to the Eiffel Tower that evening. 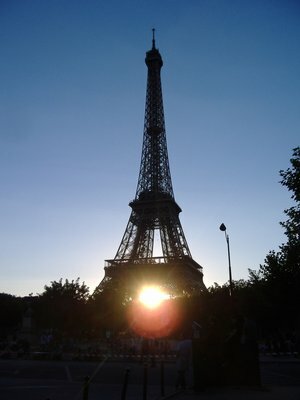 I headed out about 8:30 at night, and after a quick sandwich and beer at a cafe, headed into the Champ de Mars. 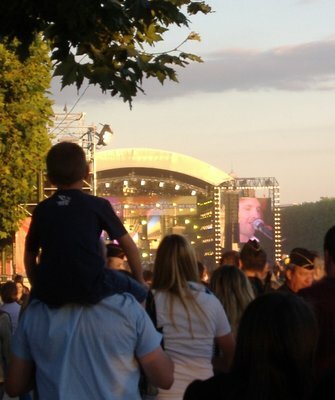 At one end of the grand Boulevard there was a stage were musicians played to a large crowd. I didn’t recognize anyone except for James Blunt, who came out for a few songs. His appeal escapes me. He looks pained when he sings, and he sounds like a cat being wrung out. Finally, the light started to fade and the anticipation built. Soon the skies would be on fire. I moved from the main area and closer to the Eiffel tower to get the best view of the fireworks. Night fell, the speakers blared to life, and the show began. Mostly I just stood and watched, moving around throughout the area to try and get the best view. Near the end of the show, I found myself standing just to the east of the Eiffel Tower, watching the fireworks explode through the open grid work of the tower. I tried filming it, but it was out-of-focus and the sound was a little choppy. I’ve included it anyway, as the last clip in the video below. As Pavoritti sings Nessun Dorma, the black lines that you criss crossing in front of the fireworks are the iron beams of the tower. At daybreak, I shall win! I shall win! I SHALL WIN! Yet another adventure that makes me envious. Your hotel looks gorgeous and Bastille Day is such a great excuse to get away. Hope you had a ton of fun! Vous ne restez-pas au l'Hotel Odeon? Haha. Non, Odeon is a great hotel if one is paying for things. But the Marriott, at €500 a night is definitely worth staying in, if you can get it for free. Which, thanks to a year of staying in Fairfield Inns in New Jersey, I could afford with my points. Either way, I don't spend much time in the hotel. Too much too see and do in a town like Paris. Vive la France indeed! I love the Bar de l'Entracte. It's in one of my favorite corners of Paris. Great entry. Thank you, Greg! You've got me missing Paris, but in a good way. Did you get to see the War Museum and Naopleon's tomb? After cemeteries, WWII museums are my favourite sites. Souds like you're having a blast on your adopted continent! I didn't see the war museum and Napoleon's tomb this time around, but have in my past trips. I'm planning on heading to see the Canadian National Vimy Memorial sometime. I am trying to see if they do anything special in early April during the anniversary of the actual battle, but so far I don't know that they do. If you get a chance, head to Juno beach to see the museum and the surrounding areas. The German bunkers are still embedded in the cliffs and there's a lot to see just walking around. The Memorial museum in Caen is a good visit, too. There's a nice ceremony at Juno beach on November 11 if you want to cross over the channel for the day.